AT THE TIME OF LISTING THIS 1998 SEA RAY 550 SEDAN BRIDGE WAS THE ONLY ONE AVAILABLE IN THE GREAT LAKES REGION, NICELY CARED FOR DON'T MISS THIS ONE -- PLEASE SEE FULL SPECS FOR COMPLETE LISTING DETAILS. LOW INTEREST EXTENDED TERM FINANCING AVAILABLE -- CALL OR EMAIL OUR SALES OFFICE FOR DETAILS. Freshwater / Great Lakes boat this vessel features Twin Caterpillar 3196 640-hp Diesel Engine's. Notable features include but are not limited to the following: Air-Conditioning & Heat (3-Units), (2) Heads (Vacuflush) w/Vanity/Sink/Stall-Showers, Washer/Dryer Combo Unit, Central Vacuum System, Westerbeke 15.0kw Generator w/Sound Enclosure (1451-Hours), Full Electronics System (VHF Marine Radio, Tri-Data w/Depth/Speed/Trip-Log, Radar, GPS/Chartplotter, Autopilot), Fly-Bridge Hardtop w/Full Enclosure & EZ2CY, Fly-Bridge Wet-Bar w/Sink/Refrigerator/Ice-Maker & Refreshment Center, Alpine Sound System w/iPod/MP3-Connection (Note Bose Surround Sound System in Salon), 50-AMP Shorepower Service w/Powered Cable Master, and MUCH more! Broker Notes: Inside heated winter stored. Professionally serviced. 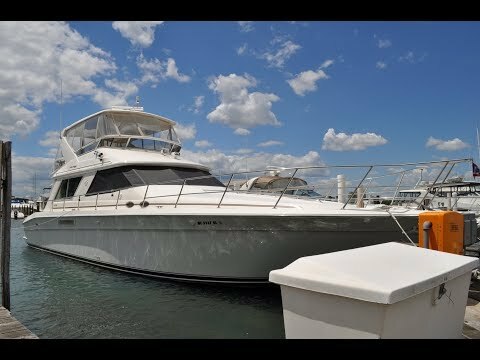 Note desirable cherry interior cabinetry, updated LCD-Televisions throughout, new stainless steel side-by-side galley refrigeration, salon wine cooler. Generator serviced '17 w/rebuilt injectors, MI Caterpillar engine review '16 w/software update. Sold new locally, this freshwater 550 Sedan is a must to consider! The Sea Ray 550 Sedan Bridge is a stretched version of the com- pany’s earlier 500 Sedan Bridge model. The 550 differs from her predecessor in that she has a larger cockpit, an improvement that allowed Sea Ray to market her as both a cruising yacht and fishing boat. She’s built on a fully cored modified-V hull, and her 15-foot beam is moderate compared with many of today’s mega- beam yachts. Most boats this size come with just two staterooms, but Sea Ray engineers were able to create a three-stateroom interior in the 550 without compromising the size of the salon. Indeed, the salon, galley, and dining area are completely open, and the galley counter serves as a convenient breakfast bar. Both heads have separate stall showers, and space for a washer/dryer combo is provided beneath the salon floor. Topside, the fly-bridge of the 550 is another big attraction—it’s huge with entertaining space for a small crowd. Unlike the 500 Sedan Bridge, the cockpit of the 550 is large enough for some serious fishing activities. The Sea Ray 550 Sedan Bridge combines the performance and advanced styling of a Sedan Bridge with the spacious and elegant liveaboard accommodations of a 55-foot luxury yacht. The 22-foot flybridge offers seating for eight. The large bridge features an advanced bridge control station, snap-in carpet, an adjustable captain's chair, and two companion helm seats. Additional seating is found on the bridge bench seat, near the bridge entertainment center, which is complete with an ice maker and stereo. For navigating in inclement weather, a standard lower helm station is found in the salon. From the flybridge, the fiberglass companionway provides wide, non-skid textured steps to the cockpit area. Through-bolted stainless steel grab rails ensure an extra measure of safety. In the cockpit, guests can relax in upholstered aft corner banquettes, separated by a center transom door that leads out to the swim platform. From the cockpit, a large glass sliding door leads to the cabin featuring 66-ounce Masland carpeting. To port is the entertainment center and a comfortable easy chair. To starboard, a 10-foot wraparound sofa provides seating for several passengers. The sofa will also serve as comfortable sleeping accommodations for two adults. The galley comes complete with a three-burner cooktop, microwave - convection oven, refrigerator - freezer, and lots of counter space. To port, meals are served amid a spectacular view. Forward and down three carpeted steps, lie the staterooms. The spacious master suite includes a full-size island bed with custom coordinated linens, and plentiful storage underneath. Multiple storage lockers and shelves, a large mirrored vanity with storage drawers, and a private head with vanity and shower complete the stateroom. Directly above the bed, a screened translucent deck hatch provides natural light and fresh air, as desired. To port, the crew quarters provide comfortable sleeping for two. The berth also includes a washer - dryer, convenient to both upper and lower decks, as is the central vacuum system. The guest head is also portside, and includes a vanity and shower. In the starboard stateroom, guests enjoy a full-size berth with storage lockers underneath and overhead, a convenient vanity and cedar-lined hanging locker.